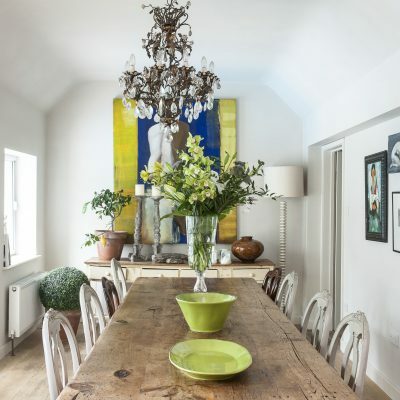 When Nina and Nick found Chilverbridge House, a stunning 17th century, Grade II-listed manor house with a semi-converted granary and coach house in Arlington, they knew it was exactly what they had been looking for. 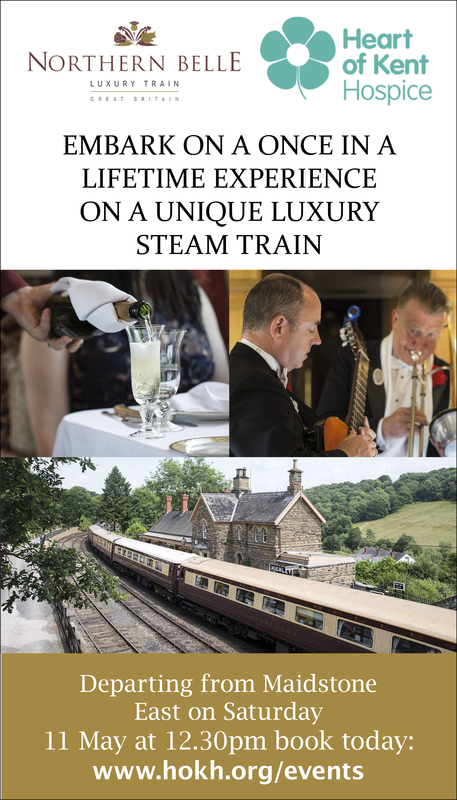 Over the last eight years they have poured their hearts and souls into the property, transforming it from a total wreck to a luxurious B&B within convenient reach of Glyndebourne. More years ago than I will admit to, a friend winkled me out of my London eyrie to admire a property ‘steal’ he’d made in the Weald. 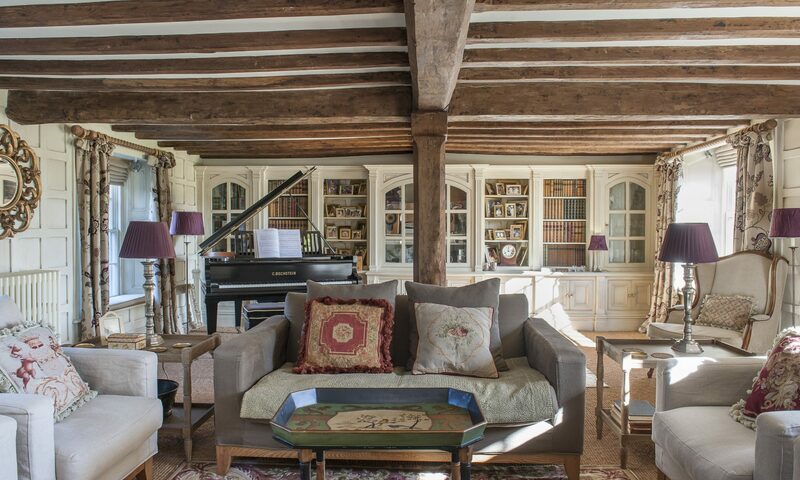 I was introduced with considerable enthusiasm to a Grade II-listed 16th century farmhouse set on high on a hill with views to die for. He’d bought it during the London property boom 13th before last and it had cost about the same as an en suite broom cupboard in Clapham. He called it a ‘project’. Alas, it was not a project. It was a ruin. We went through the downstairs ooh-ing and ah-ing over inglenooks and ancient timbers and then upstairs to the accompaniment of groaning boards and unidentified scrabblings to the ‘master bedroom’, a vast cavernous space, home to a piece of equipment that looked worryingly like a gallows. Idly, I observed that a full structural survey was probably the first step. “Rubbish! Been here for 500 years! Be here in another 500!” he shouted, jumping up and down on the boards and disappearing into the kitchen below. Resuming our conversation in Tunbridge Wells A&E, he conceded a survey might not be out of the question. And so it came to pass and there was a great wailing and gnashing of teeth and outpouring of cash in the land. Not only was the work extensive and complex but these were the days before planning officials became advisors and enablers. However, two years, a second mortgage and a repossessed Porsche 911 later, he was the owner of a truly magnificent country gaff. 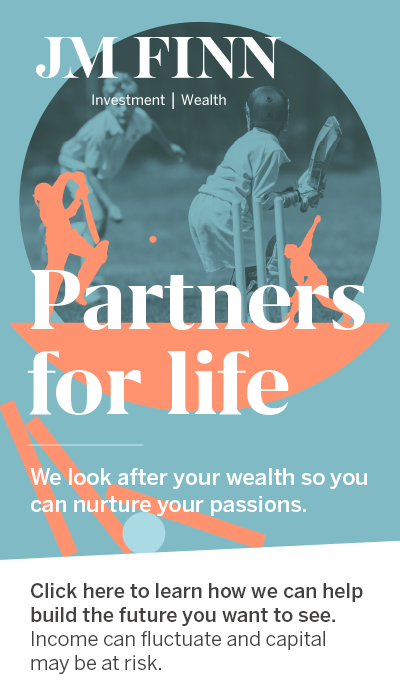 And how many of us have had this dream – to find and rescue a neglected property, lovingly restore it and give it a completely new lease of life. Certainly Nina and Nick have, although not perhaps to begin with. Originally, the couple lived happily in sunny Surbiton, a million miles from damp, decay and deathwatch beetle. However, the couple wanted Nina’s father to come to live with them and so they moved out to Maresfield and a bigger property. All was well for a while but then it was decided that her father needed his own space and they began looking a little further out and finally found Chilverbridge House, a stunning 17th century, Grade II-listed manor house with a semi-converted granary and coach house in Arlington, about seven miles from Glyndebourne. “It was exactly what we were looking for,” says Nina. Unfortunately, it was exactly what everybody else was looking for, too, so it went to sealed bids. The other slight drawback was that it was a total wreck. The first hurdle was overcome when their bid was accepted. They then turned to the second which was to prove a little more problematic and, ultimately, to result in the couple realising they had bitten off rather more than they had bargained for. 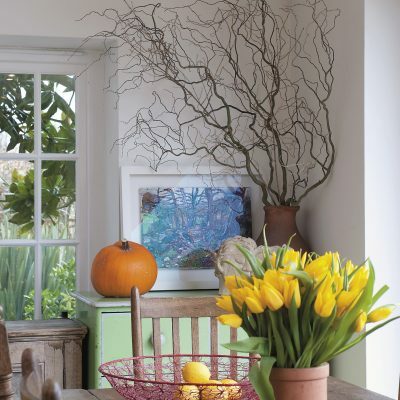 “The only heating of any kind was an open fire in the sitting room,” says Nina. All the windows needed replacing and because this is a listed building every one had to be individually made. The electrics needed ripping out and replacing. Holes in beams had been filled with concrete. Walls needed replastering, every inch of the house needed redecorating and the gardens were mud and jungle. 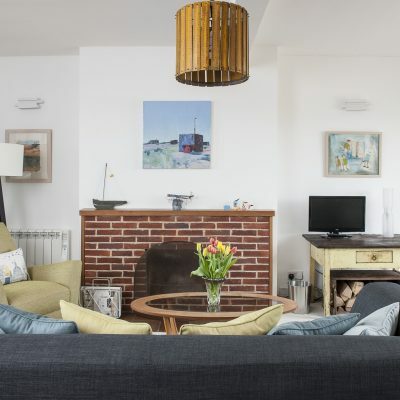 And just to complicate things, Nina and Nick thought they might, as part of the renovation, create a B&B – and not just any only old country B&B but a B&B that would be of the standard of a luxury boutique hotel. Neither had the slightest experience of renovating a property of this size or complexity or of running a B&B. What could possibly go wrong? And it certainly has been. Both the guest areas and the private rooms are a joy. 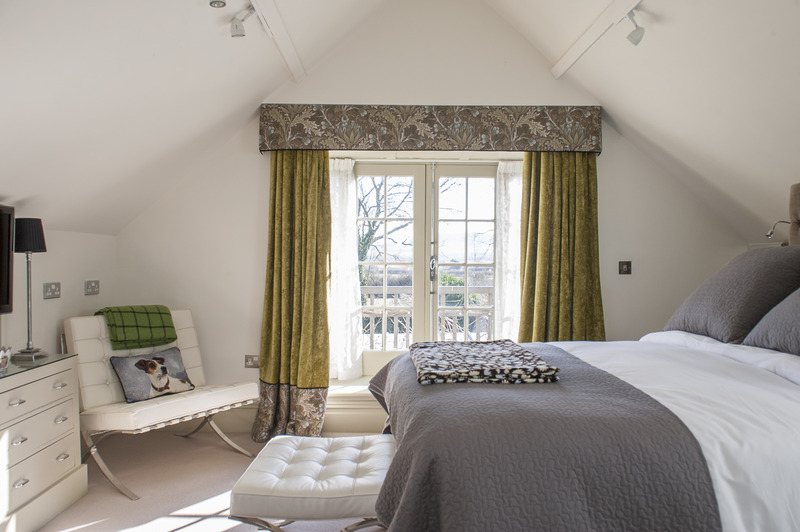 The former include an intimate dining room and an elegant drawing room and four luxury bedrooms – two in the granary and two in the coach house – all with their own bathrooms and either a private balcony or patio. 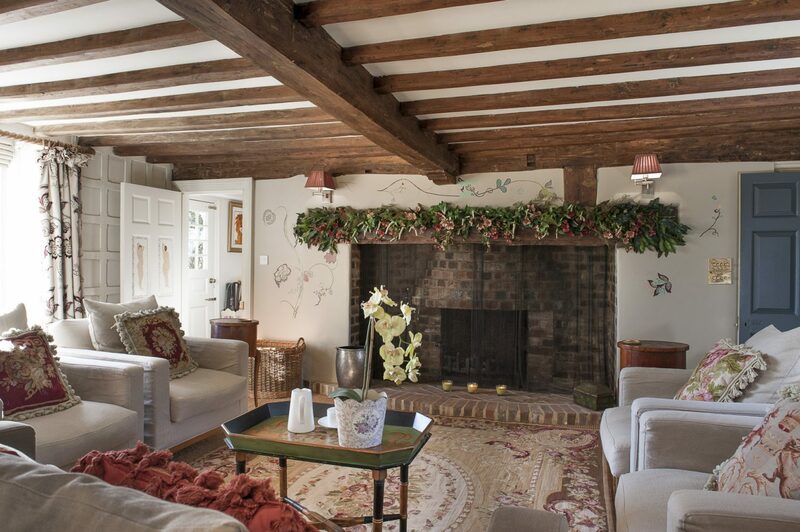 Nick and Nina’s domain includes their own beautiful drawing room and four upstairs bedrooms. 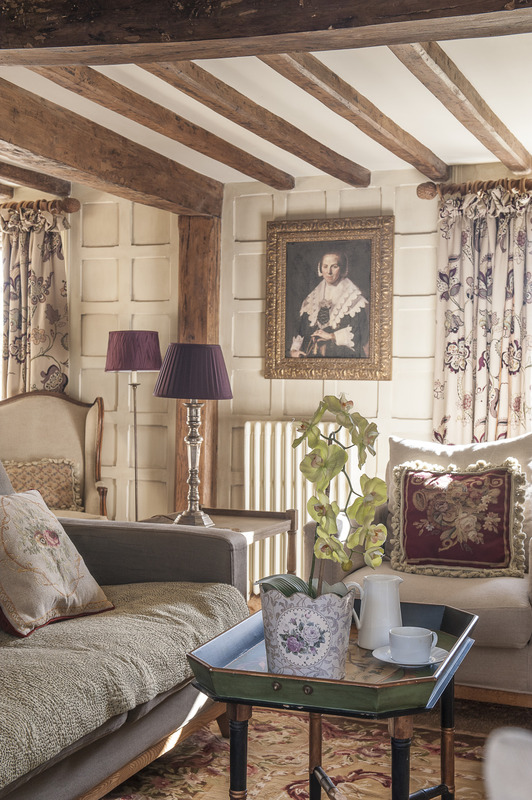 Heavily embroidered Sanderson curtains, made to Nina’s specifications by her friend Tracey Ralph who runs Creative Curtains in Hailsham, complement the Elizabethan panelling and across the imposing inglenook hangs a chain-mail spark curtain custom-made by A&M Energy Fires in Gloucester. 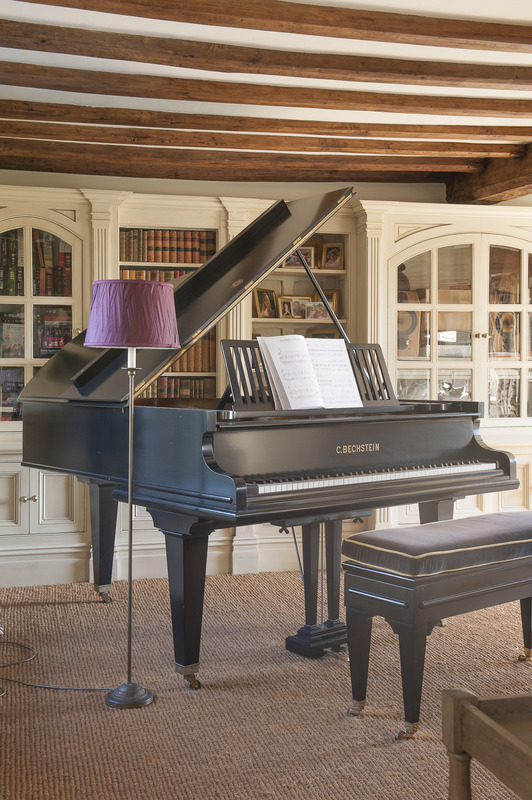 However, this is no mere hotel lounge – it’s also used by Nick and Nina, as the personal items like the family Bechstein testify, and this adds that special touch that all the best B&Bs have, the touch that makes every customer feel a real guest in a private house. The dining room is crying out for romantic candle-lit dinners but, since this is after all a B&B, is principally a breakfast room. 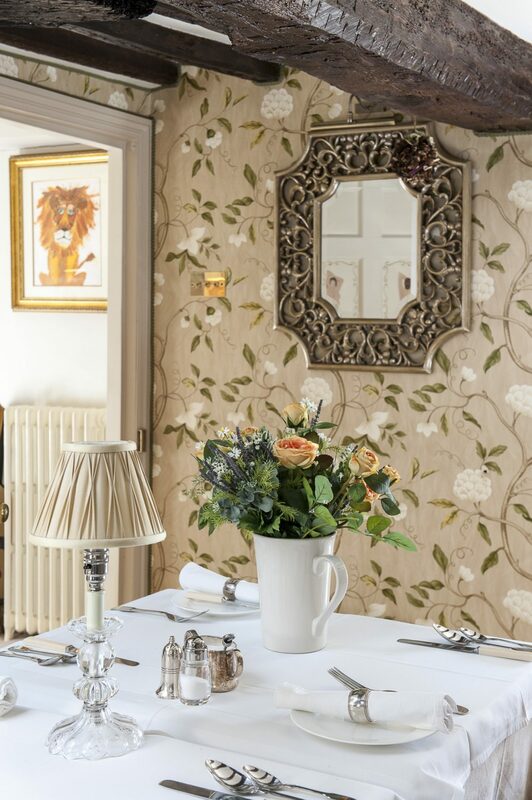 A clever and hugely effective touch here is that Nina has varnished the Colefax & Fowler ‘Snowtree’ wallpaper to give it the appearance of silk and make it glow in low light. All the tables are extendable tables for two as most of her guests tend to be couples. The gilt mirror came from a junk shop as did one of the cupboards that has now been stained and given a little gilt detailing. 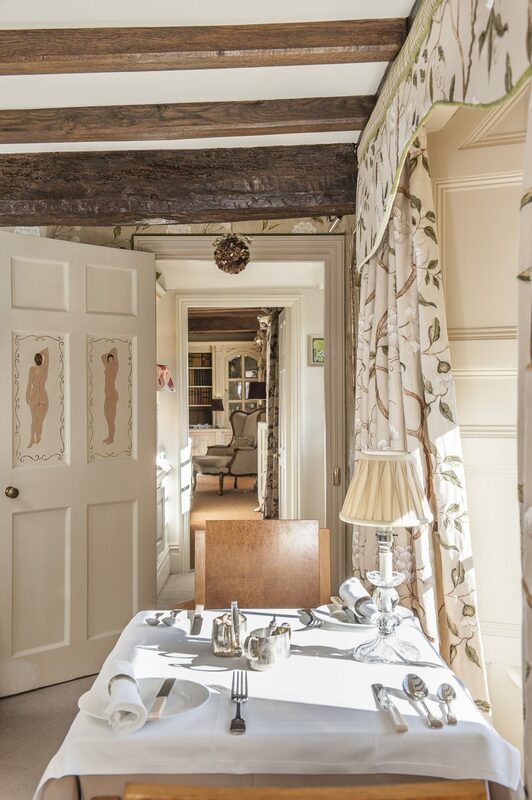 Another tribute to the Bloomsberries is in the naming of three of her guest rooms – in the coach house, Keynes and Sackville and in the granary, Bloomsbury. The second room in the granary is called Wilmington because the Long Man of Wilmington can be seen from its balcony. 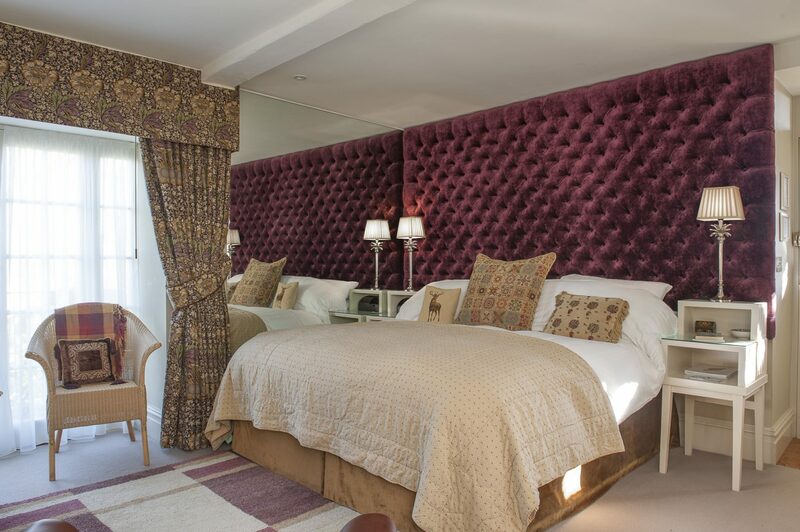 Centre-piece in Keynes is a super king-sized draped bed and antique, painted, glass-fronted armoire. 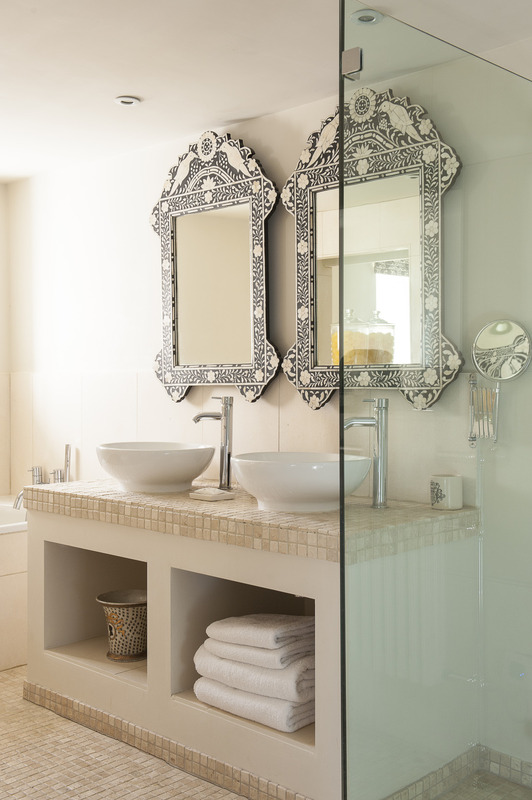 The pair of Moorish mirrors are a striking feature of the limestone en suite bathroom with its deep bath and glass-walled wet-room shower. Beyond the French doors a pretty patio provides a private vantage point from which to enjoy the gardens. Sackville is tucked away in the eaves, its vaulted ceiling and clever shutters over the Velux windows providing serious romance. An ornate hand-carved mirror, bought in Battle 30 years ago, hangs above the huge bed. 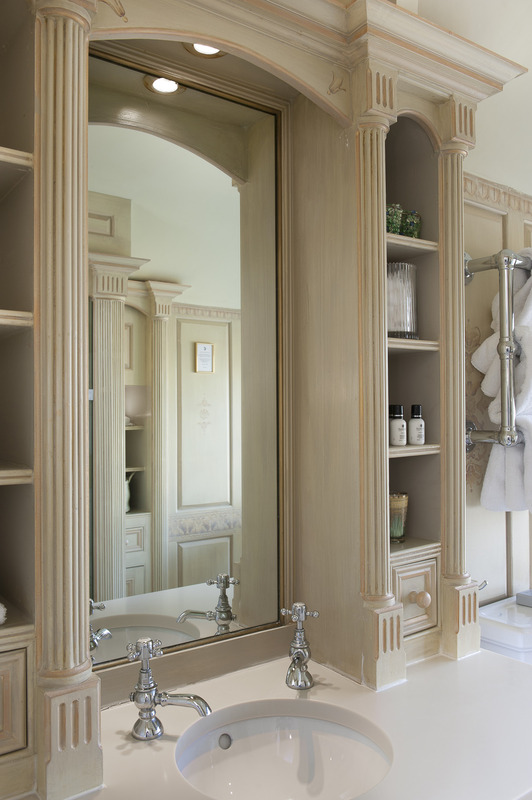 The bathroom is, quite literally, a work of art. Beautifully hand-painted by Nina, it took four months to complete and also features a wet-room style shower and a decadent slipper bath in front of the windows. 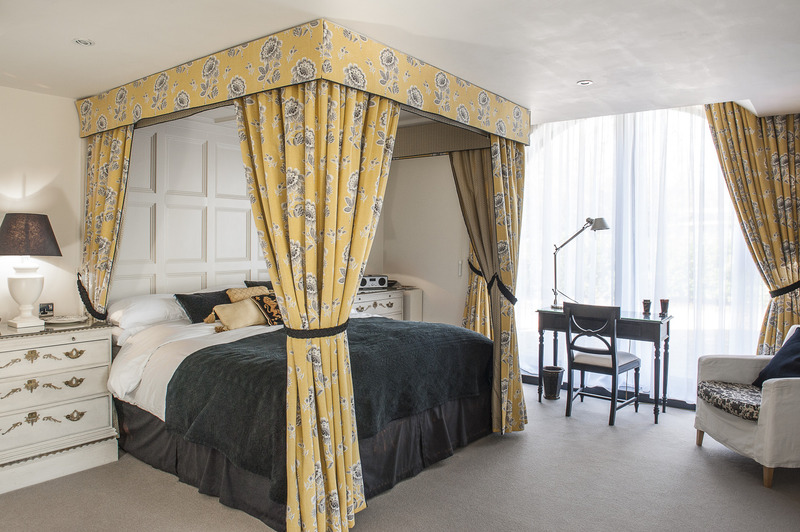 Across in the granary, Bloomsbury, with its huge lavish Designers Guild purple velvet headboard, William Morris curtains and extravagant wall of mirror is an indulgent retreat. Its smart en suite bathroom offers both bath and a wet-room shower big enough for two. French doors open onto a private patio overlooking the peaceful walled gardens. A private staircase winds up to the first-floor hideaway that is Wilmington, its contemporary feel, accentuated by its elegant Barcelona chairs most favoured by Nina’s younger guests. 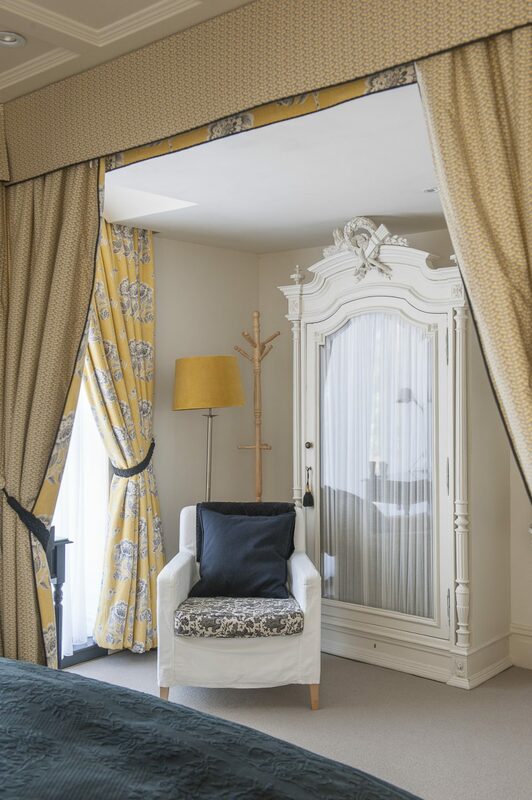 Period panelling surrounding the bath contrasts with the glass walled walk-in shower and the private south-facing balcony offers spectacular views across the South Downs. 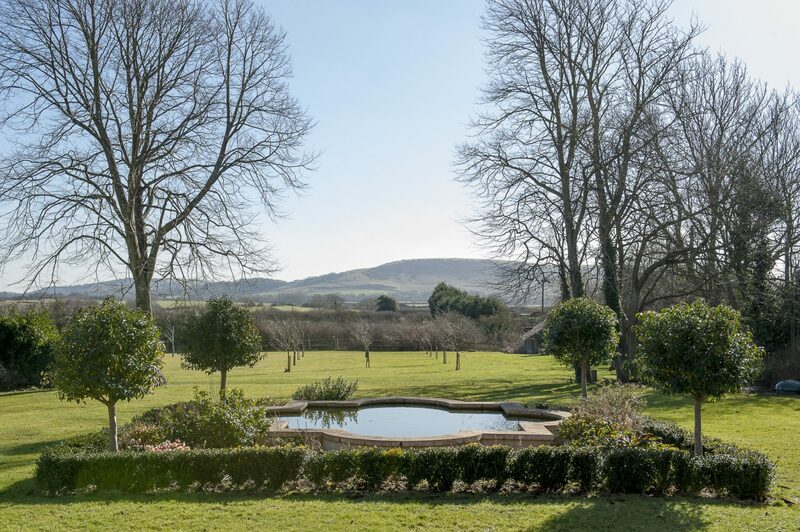 The latter, indeed, is one of the property’s most fabulous views – of the Long Man – and it was not until some time after they bought the property that the couple realised they were in possession of not only a unique property but a unique view. Guests are also welcome to enjoy the gardens, something they certainly could not have done when Nina and Nick first took over the property. Then the grounds were just a rural wasteland into which, somehow, an imposing ruin had parachuted – a sea of mud, bramble and hawthorn. 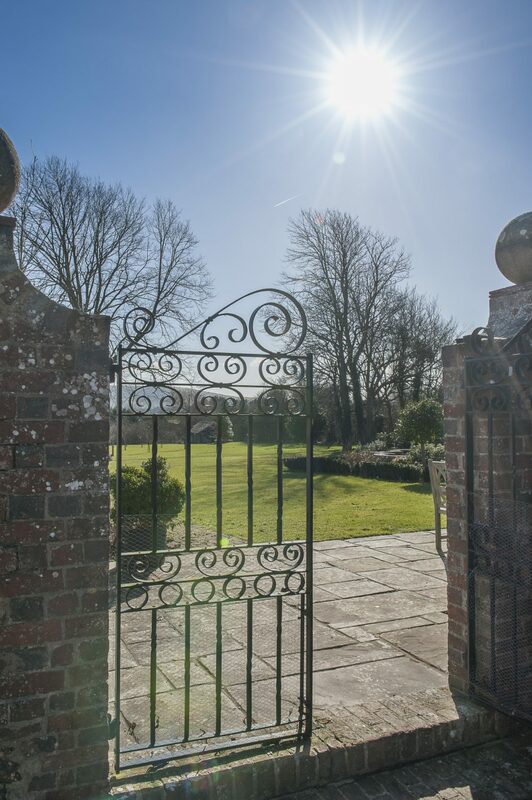 Over the years, the lovely walled garden has been slowly restored to its former glory, probably to a greater glory. Like all the decoration and furnishing of the house, virtually all the work on the garden has been done by Nina and Nick themselves. 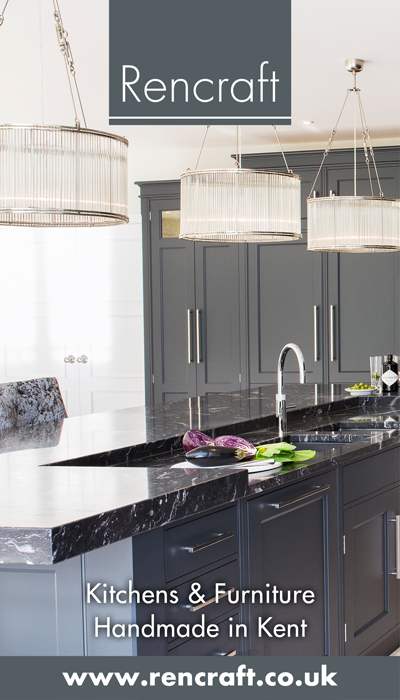 Taking on the restoration of any house that needed the amount of work that Chilverbridge was crying out for, requires not only belief in oneself and one’s ability to stay the distance but belief in the property itself. Belief that one day it will become, once more, a proud part of the landscape into which it was born. Belief, too, that it will once again be a home. 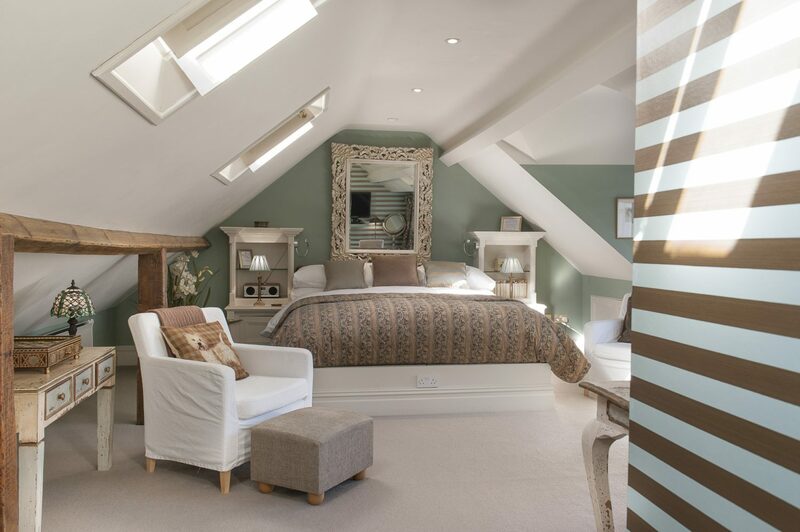 Nick and Nina clearly shared this view and the result is the re-birth of a superb old manor house that not only they but so many others will now be able to enjoy.